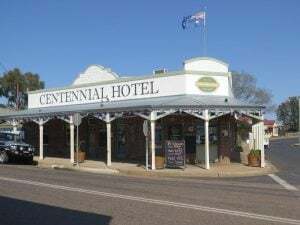 Pete flew down from the Gold Coast last night, and this morning we set off for the historical town of Mudgee (284 kms from Newcastle) in the Central West of New South Wales, in the broad fertile Cudgegong River valley. We skipped breakfast, planning to stop along the way. 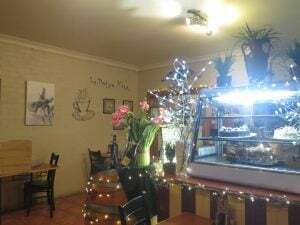 It was a beautiful sunny day, the traffic was light, and we soon arrived in the town of Merriwa and had a coffee and cake at the bakery. 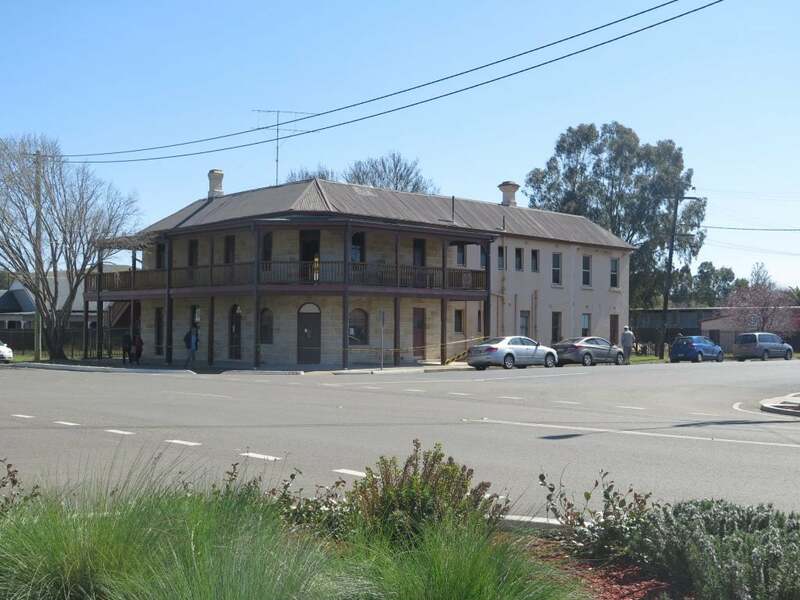 Time also to stretch the legs with a walk along the main street and to photograph the oldest building in Merriwa,(below left) and a lovely old hotel that looked as though it was being renovated (below right). 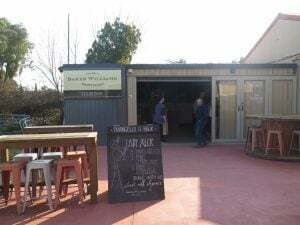 The local Welcome group was open and we were impressed with the amount of craft produced by the community and had a chat with the volunteer who was manning the shop about the lack of rain in the area and the effect it was having. 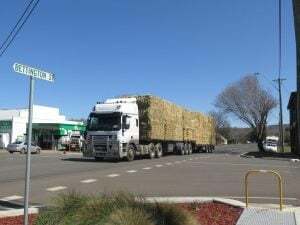 As we were walking back to the car we saw a huge truck carrying a load of hay for the needy animals on some local farms (right). 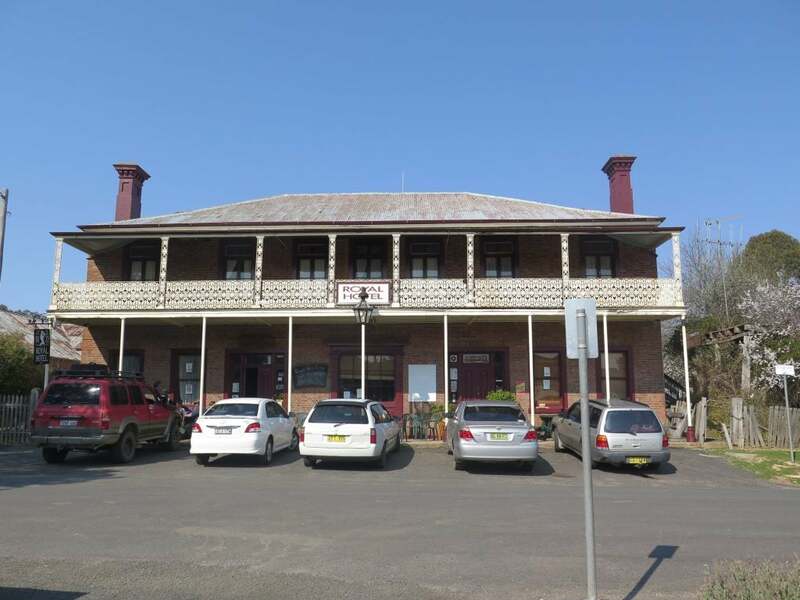 The small rural town of Merriwa is located at the western extremity of the upper Hunter district beside the Merriwa River. 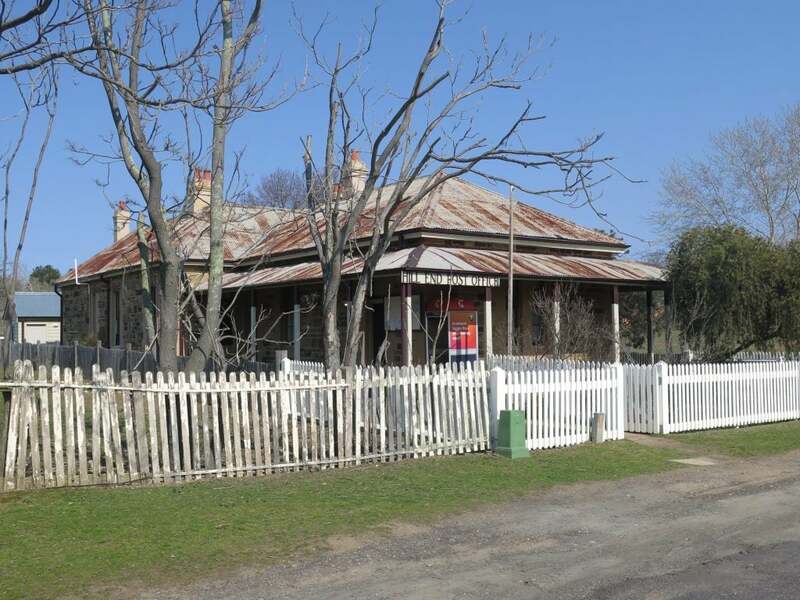 It has an easy rural charm being primarily a service centre for the surrounding properties. 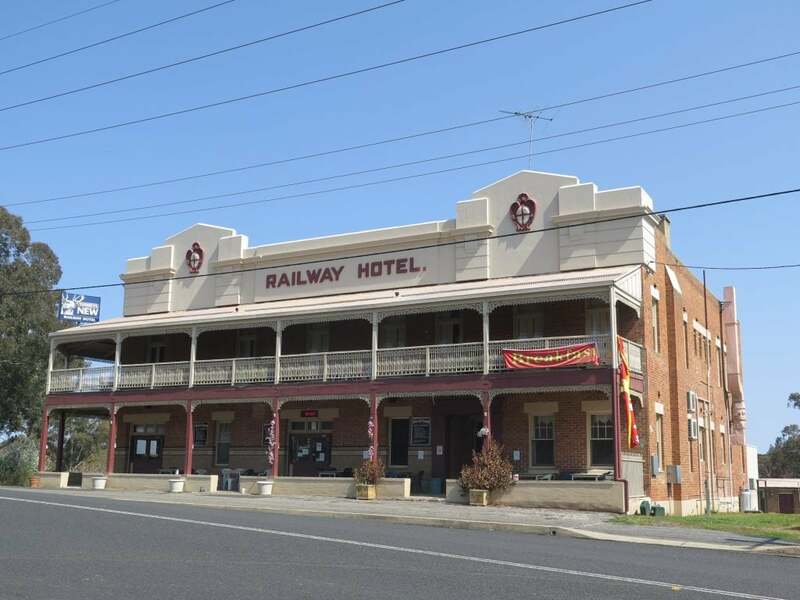 The town has a number of historic buildings and the Goulburn River National Park and Battery Rocks offer excellent bushwalking. Merriwa is a Wiradjuri word which is thought to mean ‘grass seeds’ or ‘flour made from grass seeds’. There was an interesting corrugated iron mural on one of the buildings (left). A little further along we were warned of an extra wide load and soon after were faced with police vehicles indicating we had to pull right off the road to allow the truck to pass, carrying what looked like a massive piece of mining equipment. A few kilometres further and we had to repeat the process with another extra wide load, I was quite apprehensive as we didn’t have much room to pull over, but all was well, those drivers must have nerves of steel! 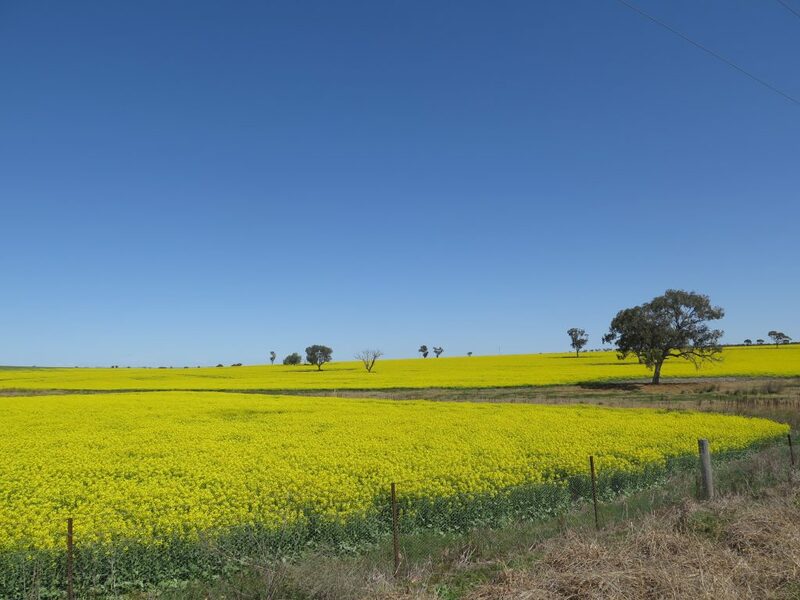 Then in the distance we could see acres of bright yellow canola flowers so of course had to stop to take a photo of this brilliant sight, obviously the canola plants had defied the current drought. We noticed that Cassillis (formerly known as Dalkeith) was ahead and decided to take a short detour to see this old town. 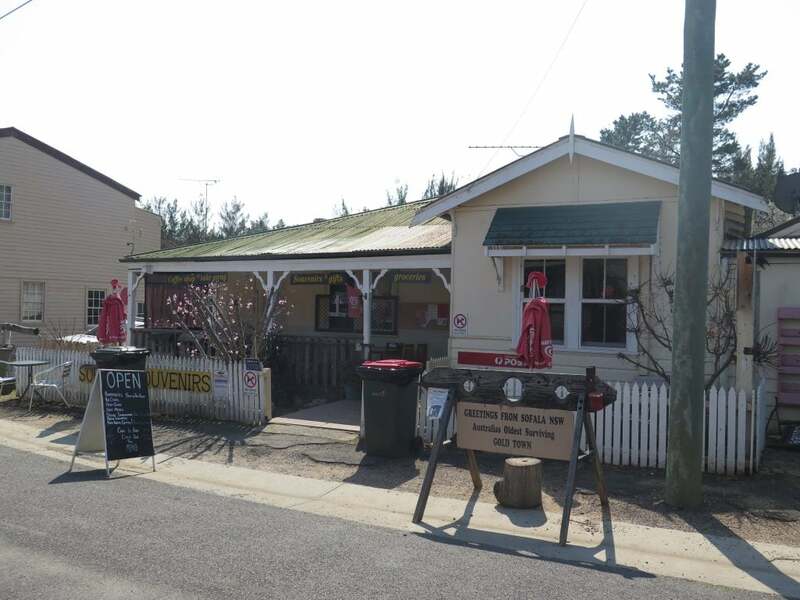 Cassilis is a small, historic village lying between Merriwa and Dunedoo. 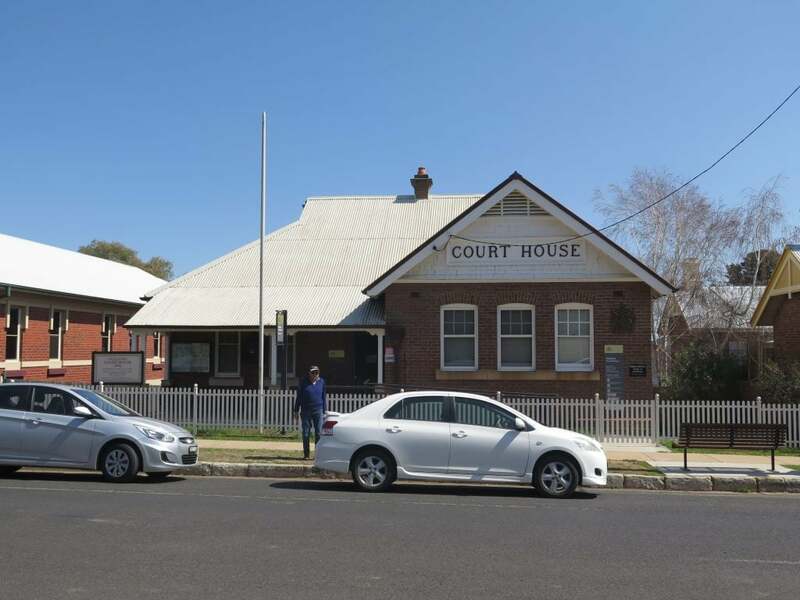 It spreads out on land beside the Munmurra River and is now little more than a few residences, a hotel, two churches and a sandstone Police Station. 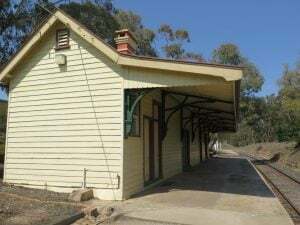 The main appeal of the area is the beautiful feature known rather unromantically as “The Drip” where clear spring water breaks through a sandstone cliff and “drips” into the tiny Goulburn River. 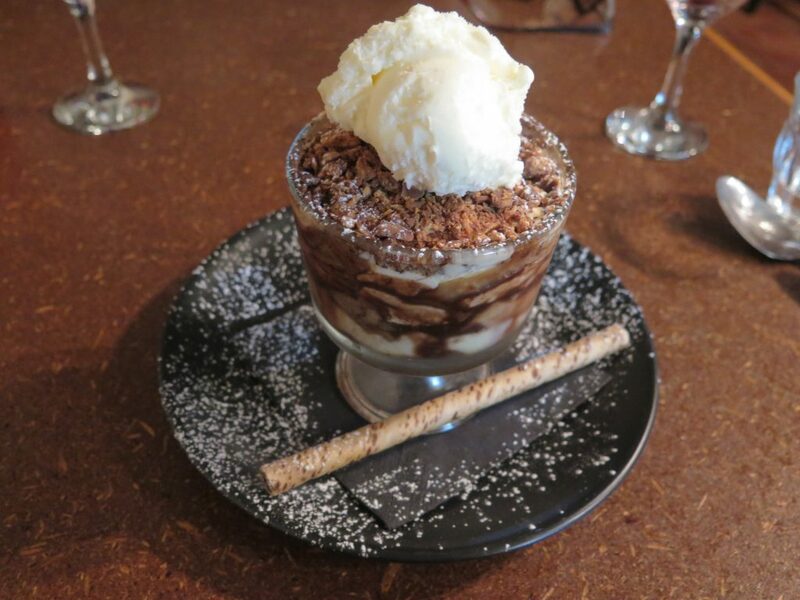 It is believed that Cassilis takes its name from a small village in Scotland. In the 1830s it was a private village named Dalkeith which served the Cassilis and Dalkeith stations. The former property was granted to Alexander Busby in 1835 and the latter to Donald McIntyre in 1834. 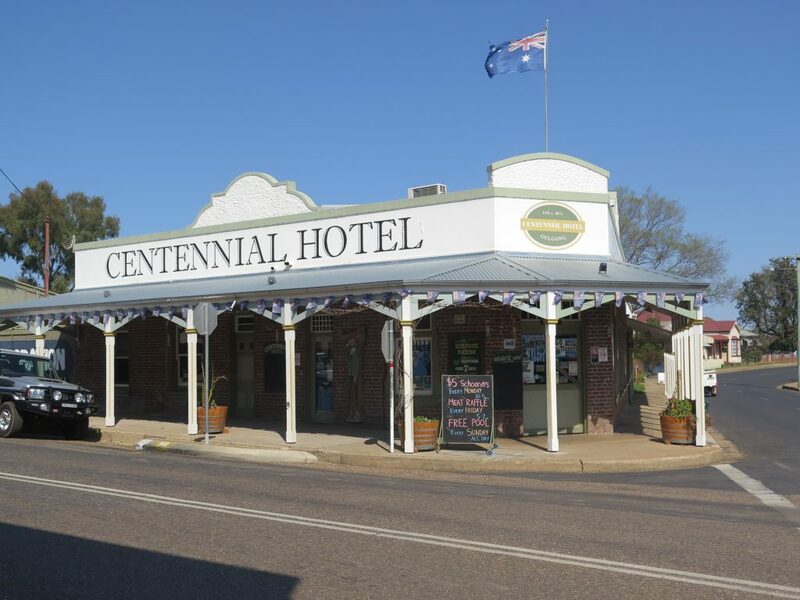 The village became a stopover for coaches bound west from Muswellbrook. It was gazetted as a town and named Cassilis in 1869. 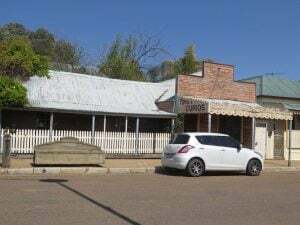 We had a wander around the town and took a few photographs, but very little now remains of the original township and it is almost a ghost town. 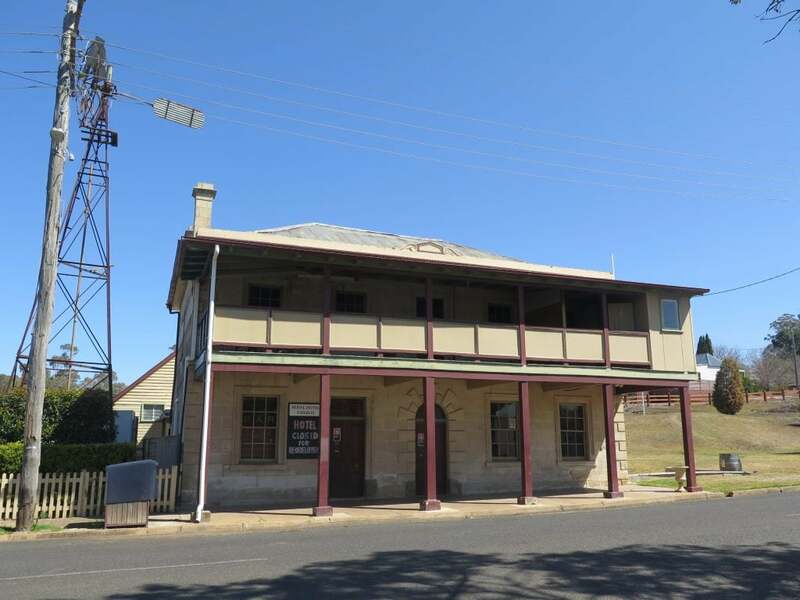 Below is an old building with a “Museum” sign on the side (below left), and the old hotel with a sign announcing its planned redevelopment (below right). 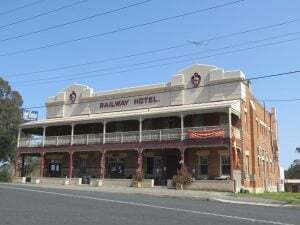 We were keen to see Gulgong and from the map it looked as though we could make a detour to Gulgong (after passing through Ulan), then head to Mudgee. 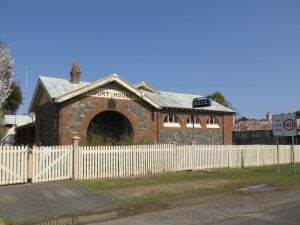 Originally we talked about whether there would be facilities open in Gulgong on a Sunday afternoon, however we thought it was worth a look. 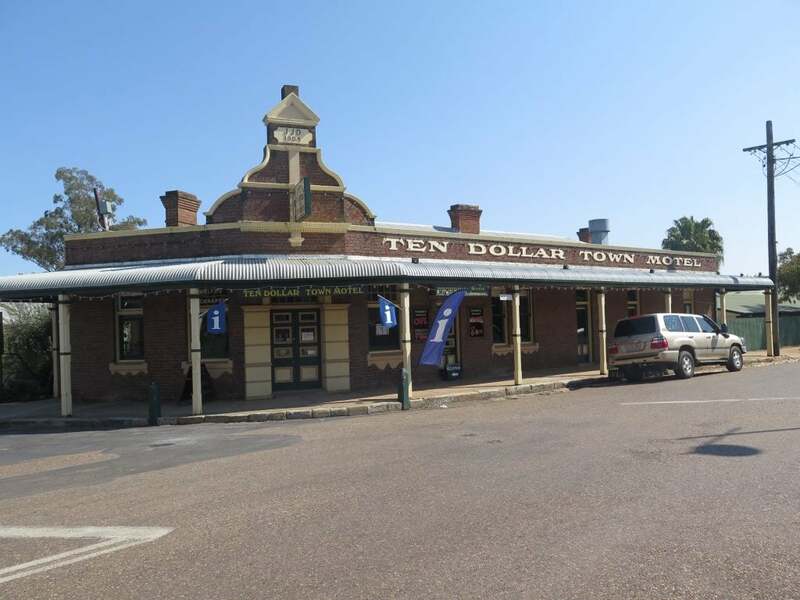 As expected, there was nothing much happening in Gulgong on a Sunday afternoon, so we pushed on to Mudgee and after checking into the motel, had plenty of time to walk the short distance past Robertson Park to the main shopping centre for a late lunch. 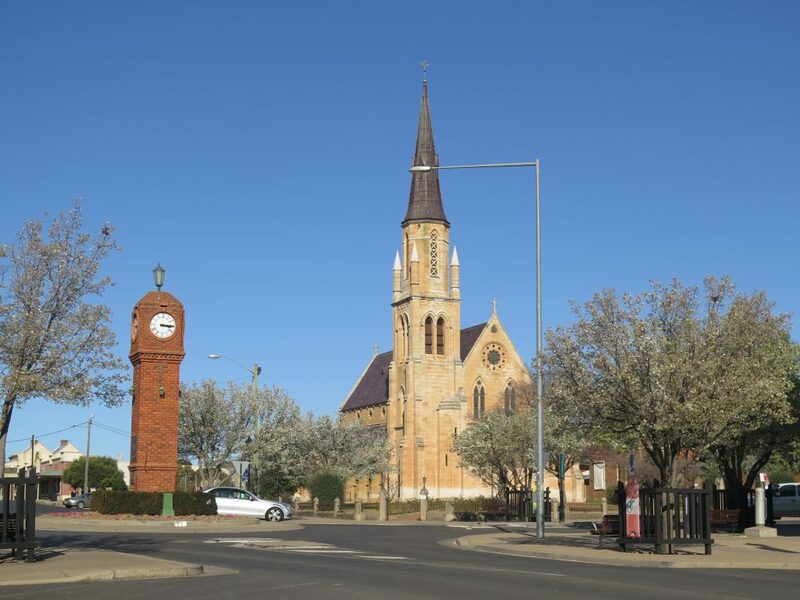 Mudgee has restored most of its beautiful heritage buildings, and it was a pure pleasure to walk along the main streets to admire the many heritage buildings (below left and right). Being a Sunday there were few cafes or restaurants open that night, however there was a hotel next door to our motel that served a great meal. Today we planned to drive in a large circle from Mudgee and return, to visit some of the historic towns in the surrounding area. Our first stop was the township of Lue (pronounced Looee) where the main place of interest is the local pottery owned by Des (right with Pete) and Jan Howard. Des came out to meet us as we pulled into the parking space and directed us to the gallery where some of their pottery is displayed. He then invited us into his workshop which was rather incredible. Des has been a potter for 46 years in Lue and had made most of his machinery and equipment from spare parts he had found, and the results were amazing. He also had about four possums who lived in the roof of the shed and he told us about some of the antics of the possums. Des has a great interest in medieval warfare and weaponry and had hand made many of his costumes (including headwear) and weapons. We could have talked to him for much longer, he was such a fascinating story teller, but after an hour we decided we should move along. I purchased a beautiful small bowl which will be ideal for nuts or olives and will think of Des each time I use it! The town came into existence about 1913 when a cement works was established. 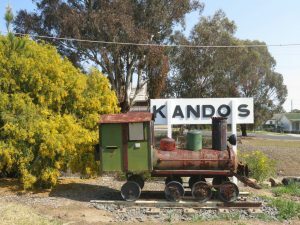 One interpretation says that the original name – Candos – was an acronym based upon the names of the six directors of the first company. Another claims that it was named after a local MP named Willliam Chandos Wall. 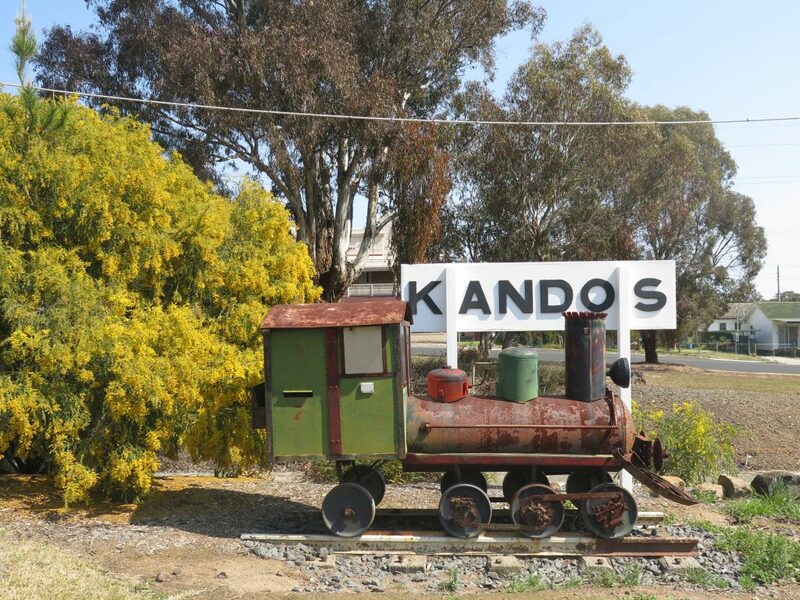 The first railway stop in the area was Chandos which changed to Kandos on 7 March, 1915. 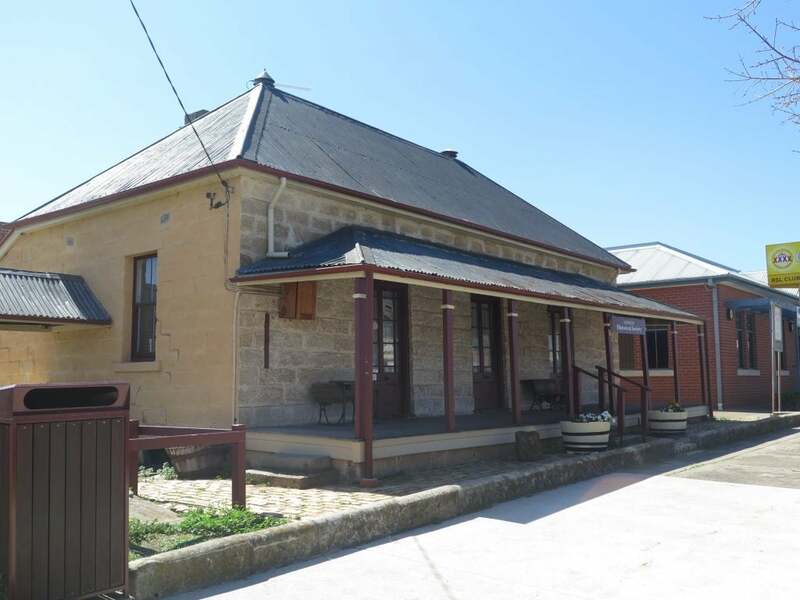 The Kandos Museum is located in the old Kandos Methodist Church at 22 Buchanan Street (below left). 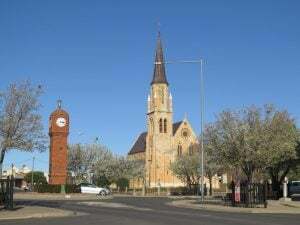 The church was built in 1919 and is the first Spanish Mission style church in Australia. It is “a modern concrete building with a flat roof and a rectangular floor plan. The cement works donated the concrete for the building. 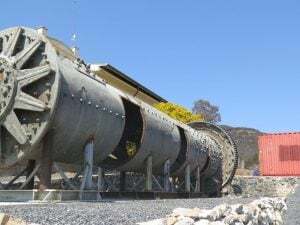 Its modernist style was derived from the Methodist church in the American home town of the manager of the cement works, Floyd S. Richards.” Its many exhibits provide an insight into the region’s industry and social history. Unfortunately the Museum was not open on the day we were there, but we were able to take photographs of some equipment that is stored outdoors (below right). Fortunately we did find a cafe/bakery for a welcome coffee! 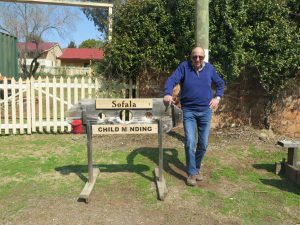 Sofala looks more like a movie set than a real town. Nestled into the Turon River valley this tiny township once stretched for 16 km along the valley and was famed for the riches found in the area, the large population of 10,000 frenetic miners, and the amusing fact that it once had forty hotels. 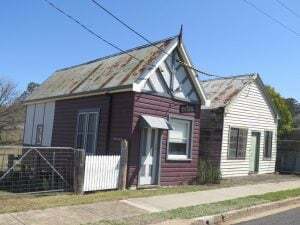 Today Sofala is a village with an authentic old world charm which, in some cases, is beautifully preserved and in other cases is in danger of falling down and disappearing (right). 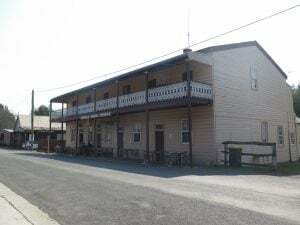 In essence its nothing more than three streets (Denison, Bowen and Barkly) which have no formal construction and no curbing and guttering and yet can legitimately claim to be ‘Australia’s oldest surviving gold town’ because the town still attracts prospectors and fossickers over seventy years after the last gold mine closed down. 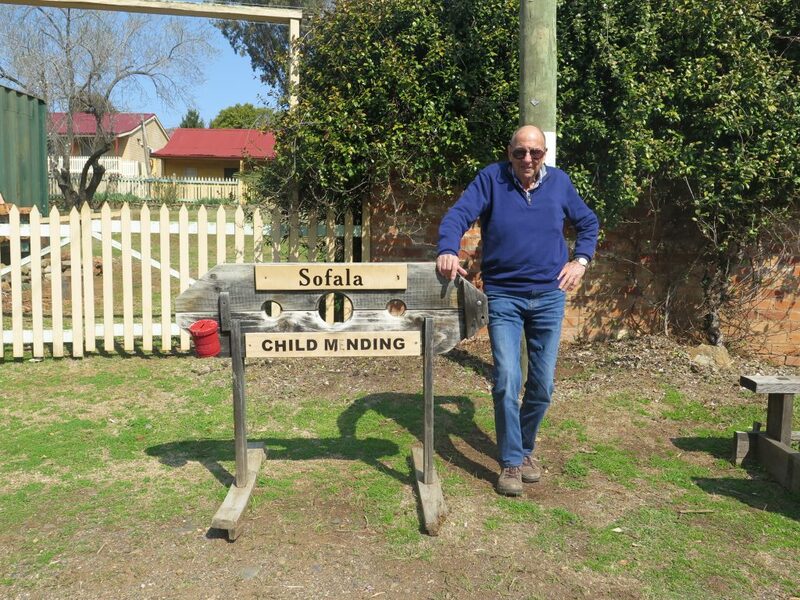 The town’s population has a sense of humour in relation to child minding and treatment of naughty people – put them in the stocks! (below left and right). 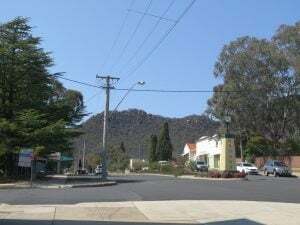 No one is sure how Sofala got its name although it is widely accepted that the prospectors and fossickers were working the banks of the Turon River before the name came into existence. It is possible that it took its name from Sofala, an historic seaport in Mozambique which had been operating since 915 AD. It is also possible that it was chosen by someone dreaming of great wealth because some sources identify Sofala as the home of the Queen of Sheba and as an unidentified place associated with Ophir which, in the Bible’s Old Testament, was a place famous for its fine gold. It is certainly a very sleepy town, the only inhabitants we saw were three men enjoying a beer outside the pub (above). 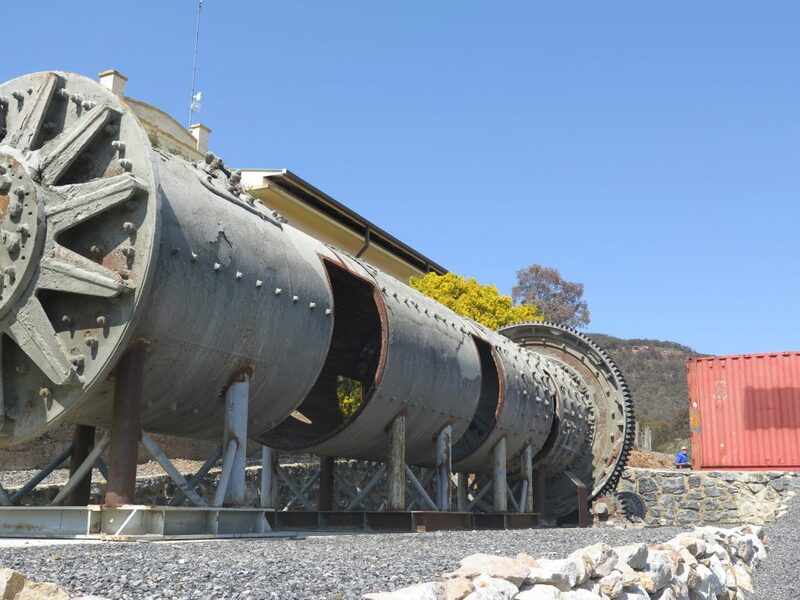 Hill End is the site of the discovery in 1872 of the famous Holterman Nugget – the largest single mass of gold ever discovered, weighing in at 285kg Almost all the Mudgee Region yielded gold. Large amounts of alluvial gold were recovered in the last century ad some small reefs were mined. 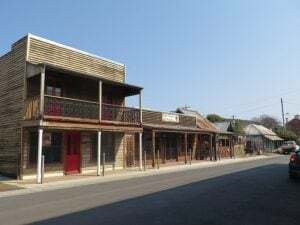 Hill End is a well-preserved gold mining ghost town which is now an important historic site and a major tourist attraction. Surrounded by rugged mountain and gorge country, it is a prosperous 19th century town held in aspic. The Historic Site can be accessed either via Mudgee from the north (66 km) or Bathurst from the south (71 km). It is an interesting mixture of National Parks & Wildlife care and signage and remnants of the old town including the local pub (below left) and cafe. 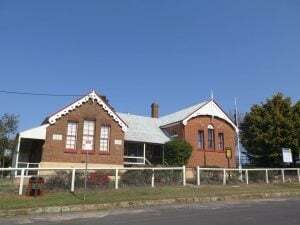 Hill End School was built in 1870 when 158 pupils were enrolled (below right). The town was surveyed, gazetted and incorrectly named ‘Forbes’ in 1860. It was renamed ‘Hillend’ in 1862 and this eventually became Hill End. No one knows who changed the name although Hill End does sound like a simple description. The Post Office (below right) and Police station (below left) date from the turn of the 20th century. 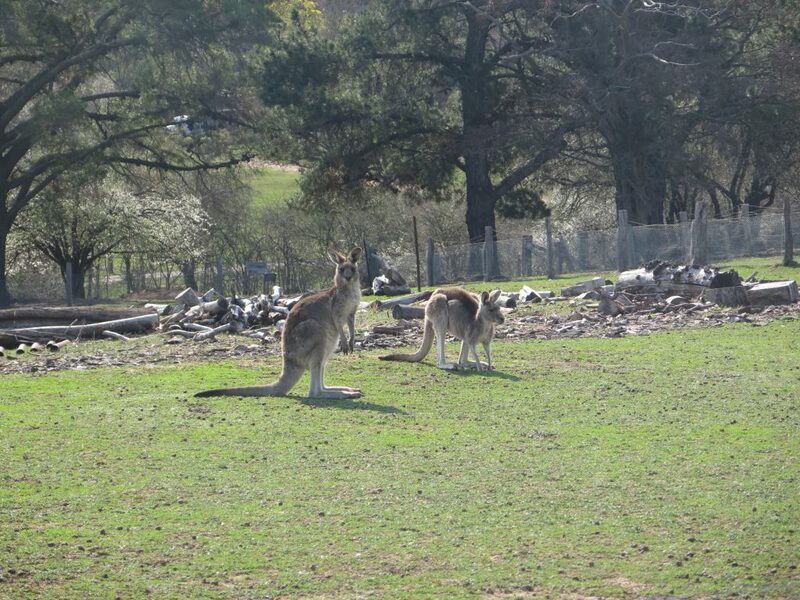 We also met some friendly kangaroos! The local cafe was just about to close at 3pm but the owner was prepared to make us a cup of tea, and we also enjoyed some of his award winning pies. 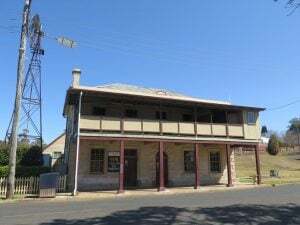 On the way back to Mudgee we drove through the old town of Hargraves, initially known as Louisa Creek, it was renamed Hargraves after Edward Hargraves, a gold prospector who claimed to have found gold in Australia in 1851, starting an Australian gold rush. Sadly, not much remains of the town. 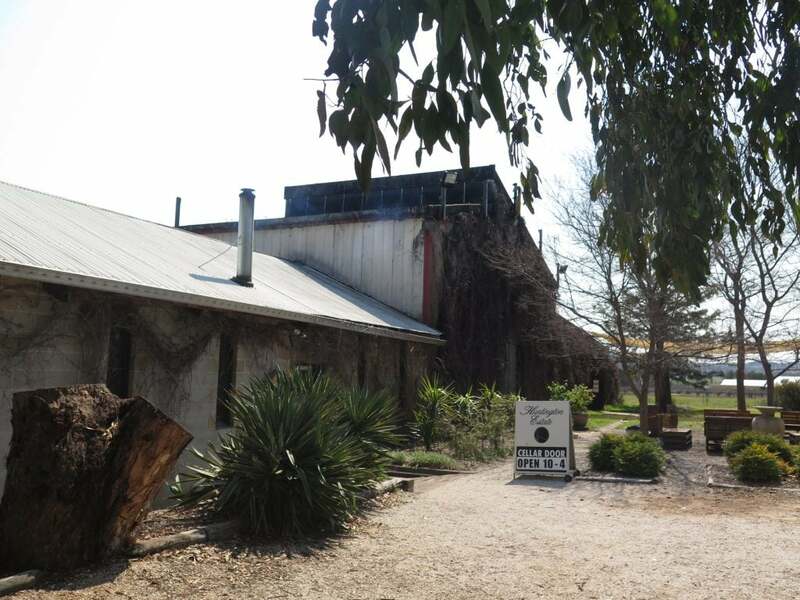 On our way back to Mudgee we stopped off at Mudgee Honey Haven. We arrived only 10 minutes before they were due to close at 4pm however we had a chance to look around, I bought a package of three small jars of honey, ginger, cinnamon and lavender, and we bought some honey icecreams. We will probably call in again on our way home. This evening we wandered into town to find a restaurant, again not all open on a Monday evening, and chose the Mi Thai restaurant for a delicious Thai meal. 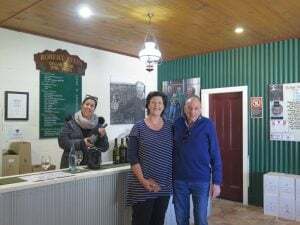 We have booked a wine tour today, and our delightful guide Maritza from Country Escape Tours collected us from our motel at 10am. 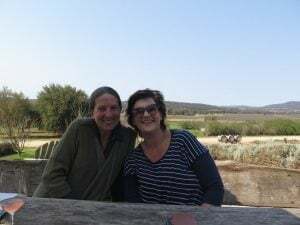 Originally from South Africa, Maritza has worked in the wine industry for many years and she decided which wineries we would visit after she had quizzed us on our wine preferences. The Mudgee Wine Festival judging had just finished, and all of the wineries we visited had won awards. The Mudgee Wine Festival was in full swing, but unfortunately we will miss out on most of the festivities over the three weeks of the festival – but something to plan for next year! 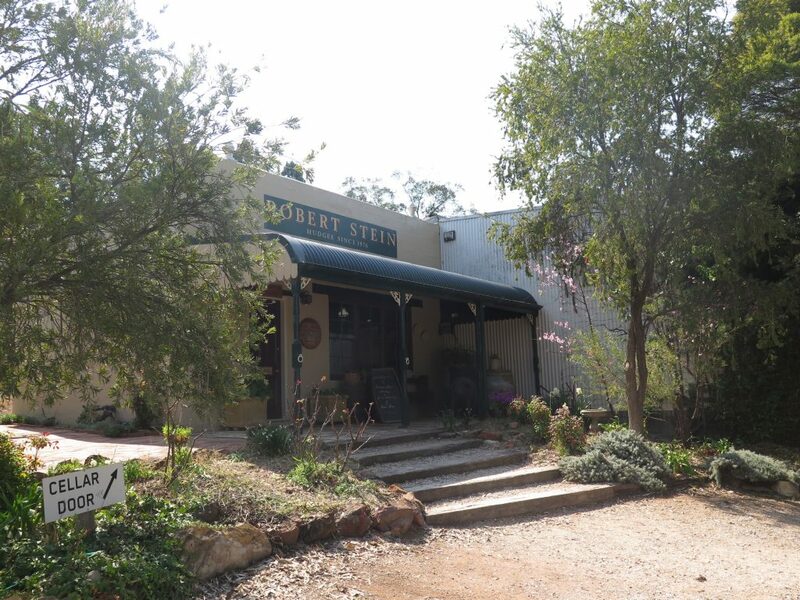 The first winery we visited was Robert Stein Winery that can trace the family history back to the earliest days of Australia’s pioneers. 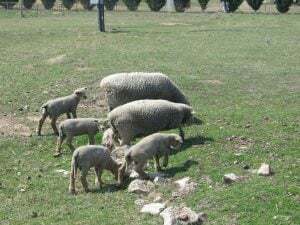 Brought out from Germany by the Macarthur family (of sheep-breeding fame) in 1838, Johann Stein carried with him the first cuttings of Rhine Riesling to survive in Australia. 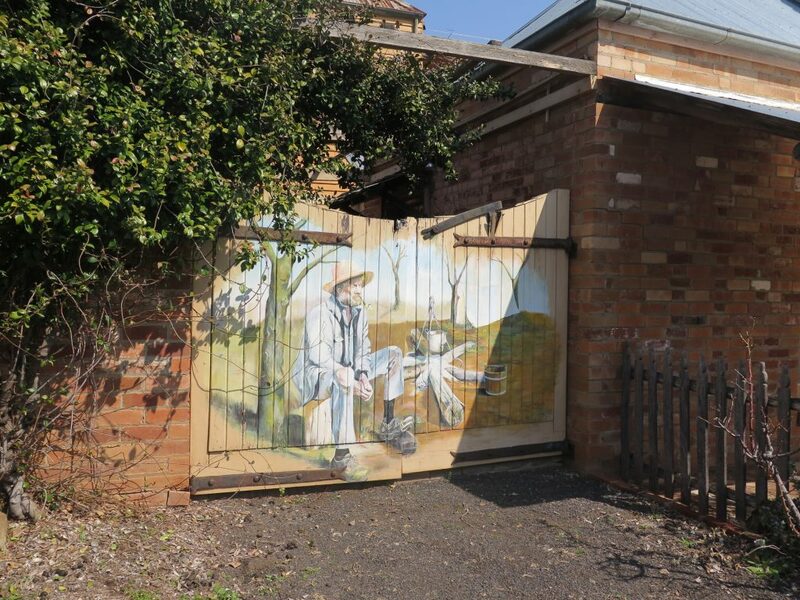 Under his supervision the Macarthur’s Camden Park vineyard flourished as one of the earliest wineries in Australia. 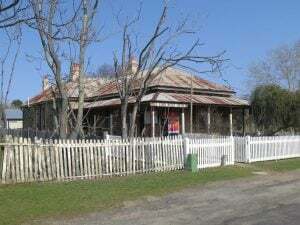 Johann’s brother, Jacob, then went on to establish his own vineyard called “Sandal Farm” on Prospect Creek near Carramar, in Sydney’s South-West. 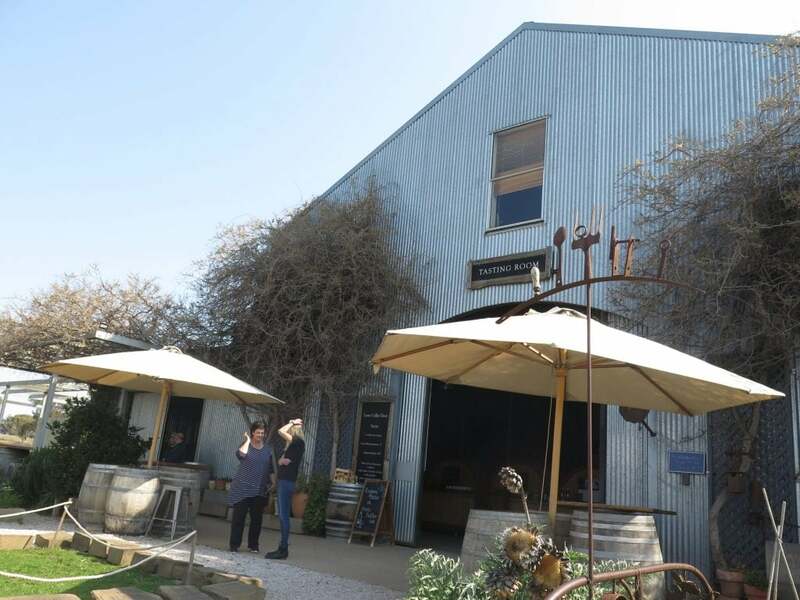 Below is the tasting room (right) and Maritza, Pete and our friendly tasting guide (left). 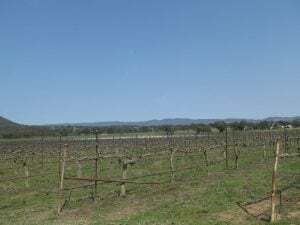 In 1976 the family tradition of grape growing and wine making was revived by Robert and Lorna Stein with the establishment of a vineyard in Mudgee, NSW. Starting with just 2 hectares of Shiraz the vineyard was further expanded through the help of friends and family to its current size. 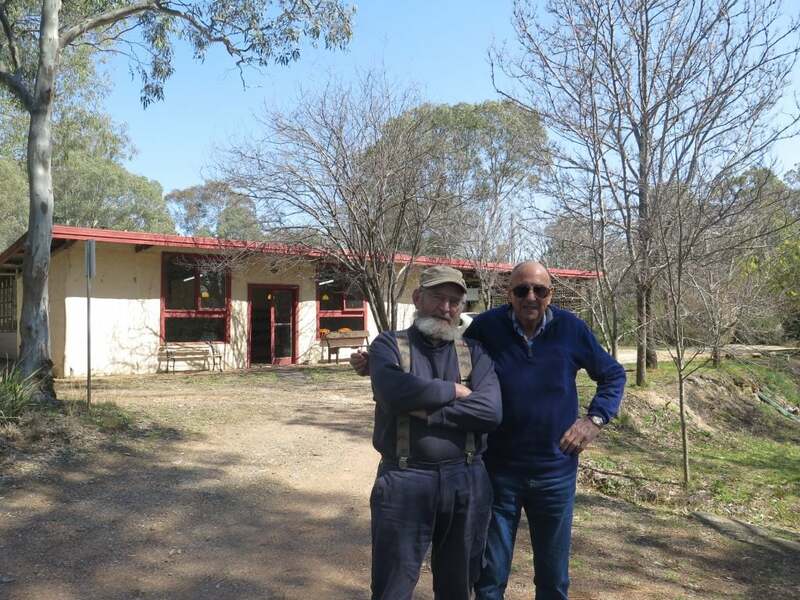 Robert and Lorna’s son Andrew Stein, who helped with establishing the vineyard, then made Mudgee his home in 2005. 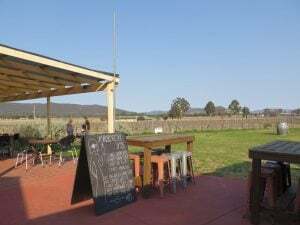 The vineyard and winery have grown to become a successful enterprise, earning a reputation as one of Mudgee, and NSW, premier quality wine producers. Huntington Estate was our next winery. One of the keys to success at Huntington Estate is low yields. 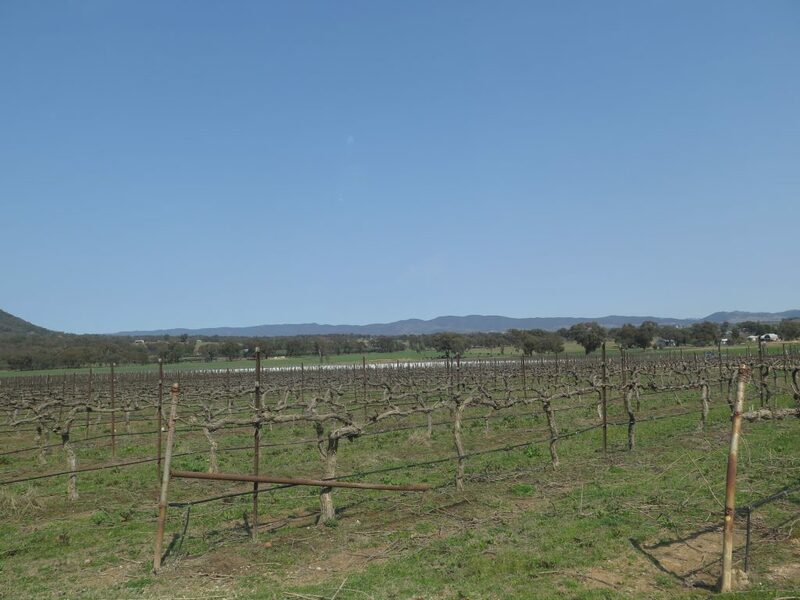 The vineyard is deliberately managed for yields of below 3 tonnes/hectare (well below industry norms), enabling vines to focus their energies on ripening a smaller crop of fruit. 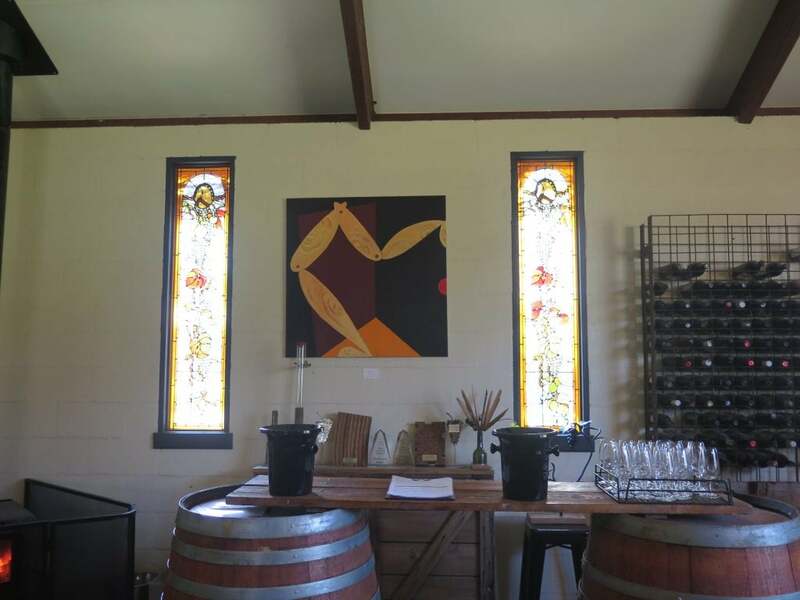 The tasting room has beautiful stained glass windows (left), below left is the winery building and below right looking over the vineyard. The cost of production is high, but the result is superior fruit. Old vines make great wines and the 49 year old vines are at their optimal balance of quality and quantity of fruit produced. They are planting the old vines of the future now, and vineyard renewal is an ongoing exercise. The entire vineyard is subject to irrigation, although it’s used sparingly to supplement rainfall. 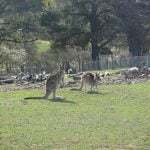 There are two large areas of nature reserve in the vineyards to encourage bio-diversity, and to house the resident mob of about 80 kangaroos, and all the wrens, parrots, kookaburras, rodents, reptiles, Boobook owls and the odd wombat. Short Sheep Winery (below right) was a winery with a difference – their Southdown Babydoll sheep are regarded as part of the team, and are an integral component to the long term sustainable management of the vineyard. Grazing underneath the vines, (below left) they reduce the need for herbicides to manage the vine undergrowth, de-succur the vines and reduce the requirement to slash in between the rows and the need for diesel fuel. Some of the sheep were in the shade right beside the tasting room, so we were able to see them and their short woolly legs! 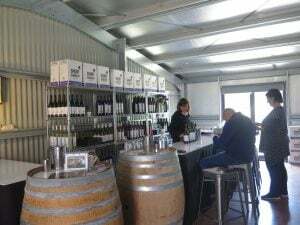 All wines are handcrafted in small batches, using handpicked fruit from low yielding vines by the “Head Ram and Ewe”, Tony Shadbolt & Sue Ridler in the Short Sheep Micro-Winery. 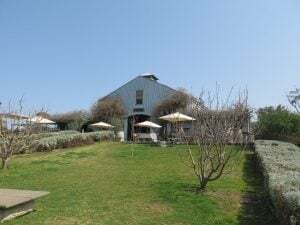 Our longest stay was at the organic vineyard, farm and winery at Lowe Wines as this was also our lunch stop. Maritza (our guide) had worked at this winery and happily introduced us to the staff who organise the tasting. The winery (above left and right), now a certified organic facility, specialises in small batch winemaking using innovative techniques, the Mudgee vineyards are untrellised, unirrigated and certified organic. They produce lower yields of distinctively individual grapes; one of four flag ship varieties being Zinfandel. The winery is leading the field with practical sustainable management in their vineyards and on their farm. 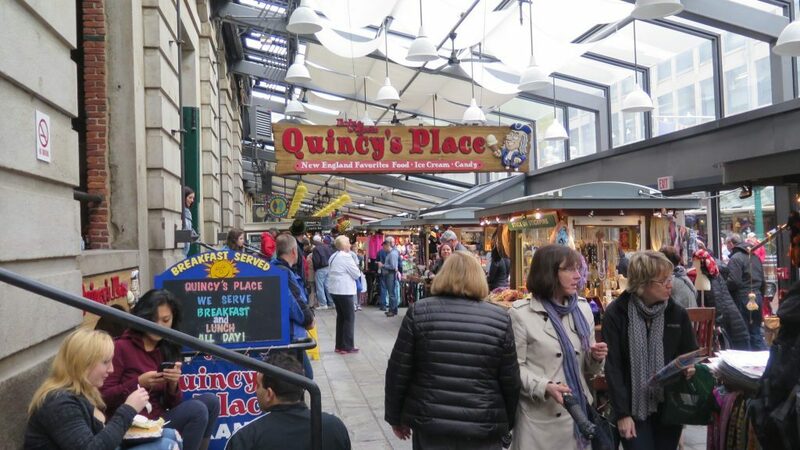 Distribution concentrates mainly on restaurants and independent bottle shops. David Lowe has been working in the wine industry since the age of 15. 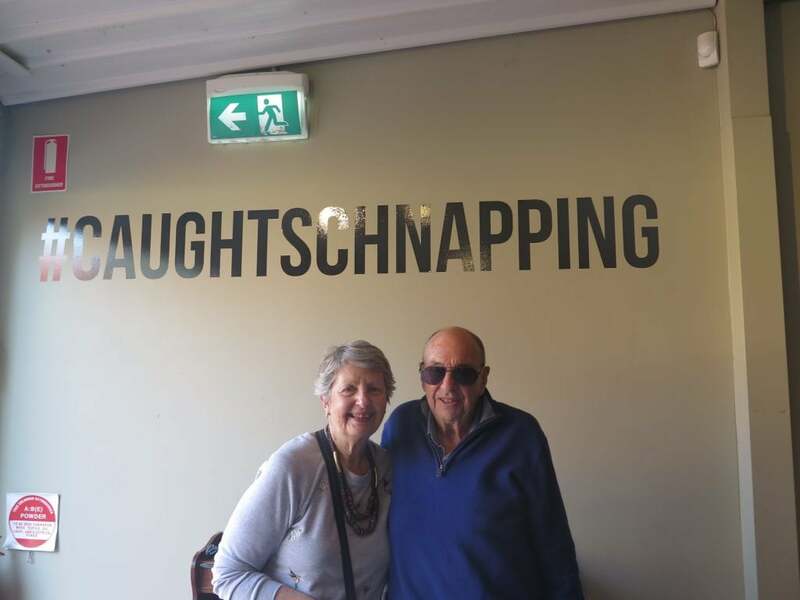 He qualified with a winemaking degree from Roseworthy College in 1979 having started his career at Rothbury Estate in 1978 where he rose to become chief winemaker and group vineyard manger. 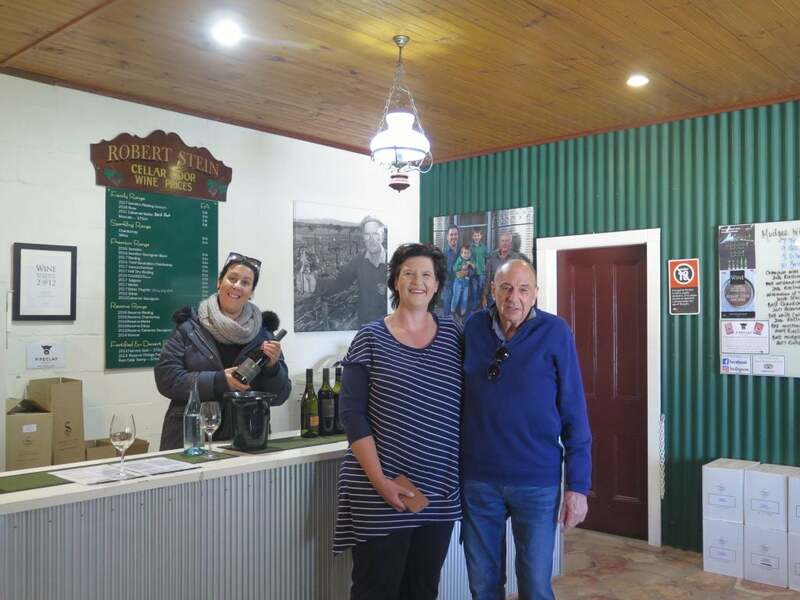 During this period Rothbury Estate was an extremely high profile Hunter Valley company under the chairman Len Evans. David has spent five vintages in Bordeaux, France as a flying winemaker, and has previously held the positions of Vice President of the NSW Wine Industry Association and Vice President of the Winemakers’ Federation Australia. After spending an interesting session tasting the wines and learning more about the vineyard, we joined Maritza and her business partner, Sandy, in a shady spot outside the winery with fabulous views across the valley to the mountains. 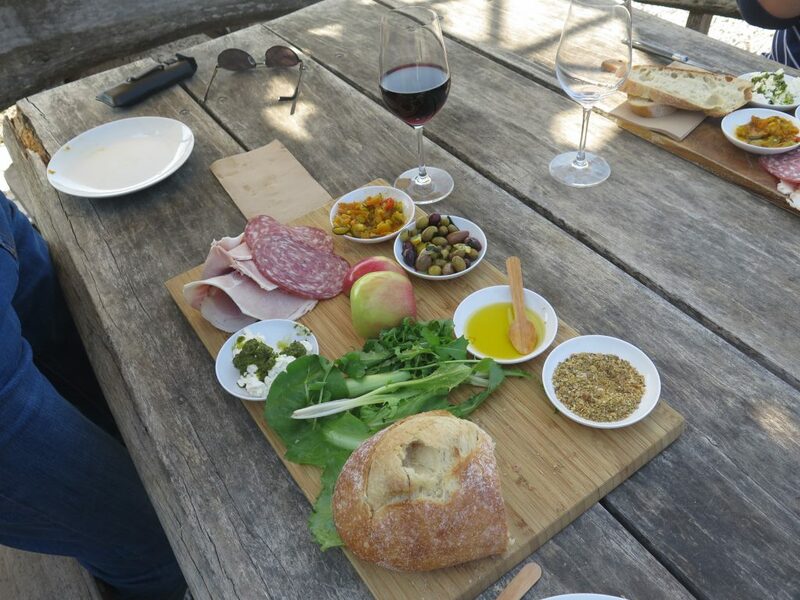 With a delicious antipasto board and a glass of red – who could ask for more on a beautiful sunny Mudgee afternoon. Our last stop was to Vinifera Winery, and the Baker Williams Distillery that was next door. Tony McKendry (Vinifera Winery) says on his website – “We planted the vineyard over 20 years ago, however this dream had been an even longer time coming…..We believe that less is more in our approach to wine growing and making. We are committed to producing authentic, terroir-driven vintages in tune with the environment and are proudly certified organic. In fact, look out for the local gardeners when you come to visit – a flock of sheep live amongst the vines keeping them healthy and sustainable. The winery also has a wonderful collection of locally made produce and I couldn’t resist a bottle of caramelised White Balsamic infused with Ginger, Kaffir Lime and Lemongrass, and a jar of Sweet Chilli Relish, plus a pack of four baby bottles of their Organic Sparkling Maddy, named after their first grandchild, Madeleine. After we had finished our tasting a group of young people arrived who had obviously been having great fun tasting numerous wines during the day and were quite noisy, so we adjourned next door to the Baker Williams Distillery. According to part owner Nathan Williams (who runs the Distillery with his wife Helen), He said ‘Lets build a distillery’. She said ‘Lets make Butterscotch Schnapps’ and the rest is history. Baker Williams Distillery is a Micro Distillery (below left). They make handcrafted spirits and liqueurs focusing on regional flavours & influences. 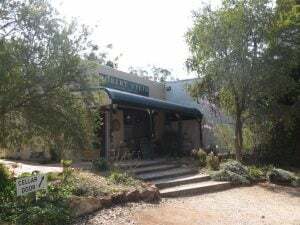 Opened in September 2012, the distillery is part of the ever growing Australian Craft Distillery industry with an expanding range of flavoursome spirits and liqueurs. We had a lot of fun with “tiny” tastings of Butterscotch Schnapps, Lemon Myrtle Liqueur, Limoncello Liqueur and Cafe Liqueur and Pete couldn’t leave without buying a couple of bottles (below right). By this time it was close to 4pm and time for Maritza to drive us back to our motel. Maritza from Country Escape Tours really made our day very special, not only did she drive us to the different wineries, she took photos along the way which she then emailed to us, she carried our bags when we bought some goodies, was a fountain of knowledge about the wineries and wines, and was very good company – we were sorry to say goodbye! 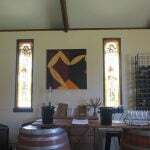 If you are ever in the Mudgee area and want to see the wineries in style, you must contact Maritza. Tonight we planned our last meal to be at Isabella’s Tratoria in the main street of Mudgee. I love Italian food, and was not disappointed with my barramundi fillet with vegetables, and Pete enjoyed his crumbed cutlets and vegetables. To end we could not resist the decadent Tiramisu with icecream to finish off a fabulous day and delicious dinner. Tomorrow we head for home. We had decided to travel home via the old historical town of Gulgong. 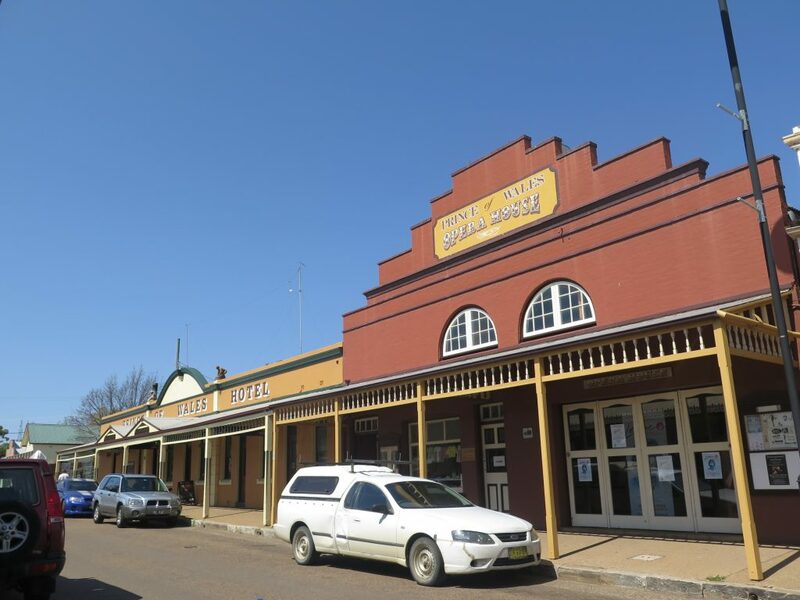 To fully experience Gulgong it is necessary to wander along Mayne Street and Herbert Street and soak up the historic ambience of this remarkable goldmining town which has over 130 heritage buildings. 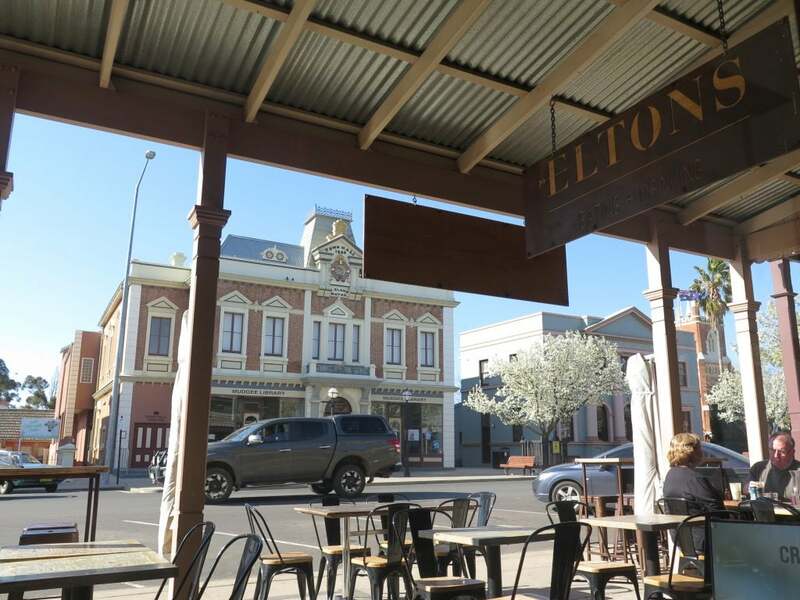 Part of Gulgong’s unique appeal lies in the fact that it began before surveyors could turn it into just another country town with a boring street grid system. Consequently the main roads in town, originally tracks for horses and bullocks, wind and meander through a picturesque and well-preserved settlement of single-storey weatherboard, iron, stone and brick buildings with old-fashioned iron-lace verandas, tiny wooden cottages, horse troughs and hitching rails. 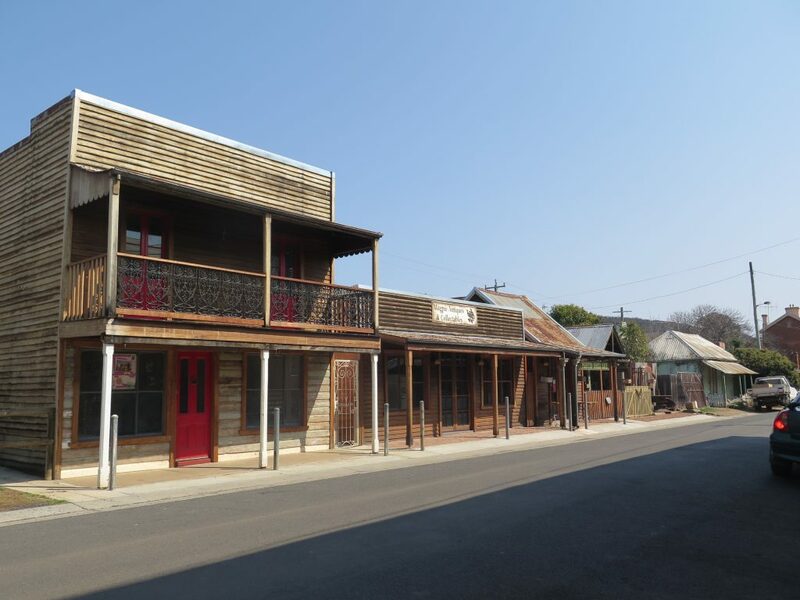 The result is a gold mining town which once was home to 20,000 and is now held in the aspic of history. 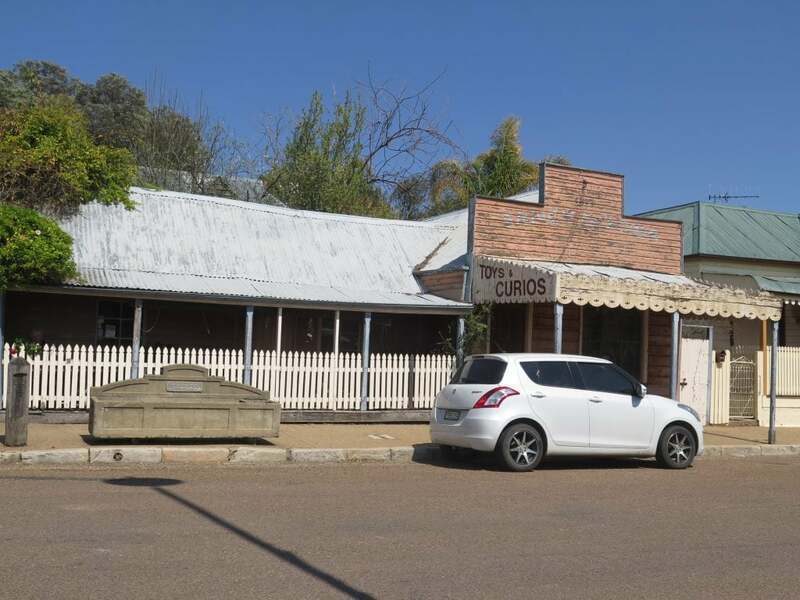 It is accepted that the Wiradjuri word “gulgong” means “deep waterhole”. At the entrance to the town we stopped to admire the beautiful and recently restored War Memorial in Anzac Park (above). 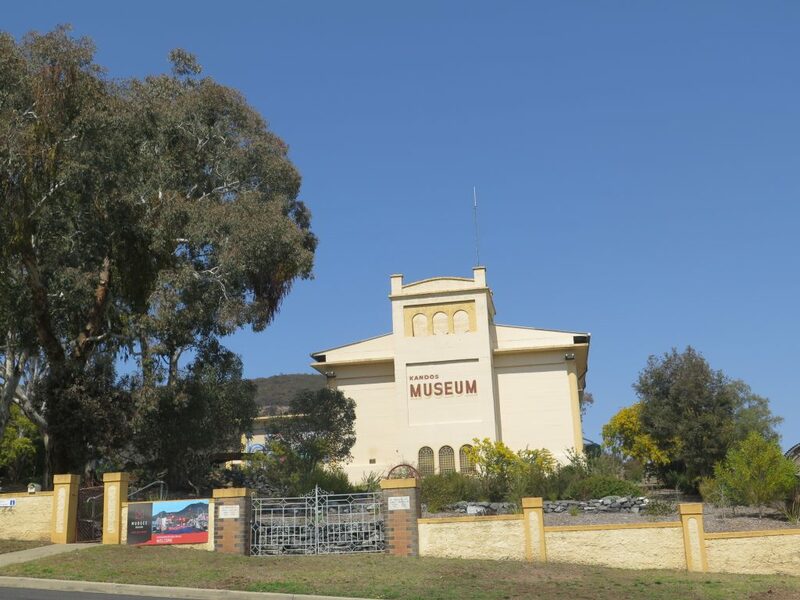 Anzac Park is located at the corner of Fitzroy and Medley Streets. 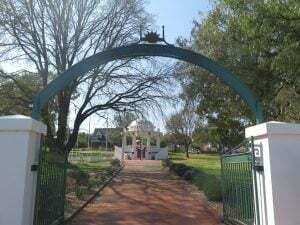 The bandstand is of particular interest as it is one of the earliest tributes to the Anzacs having been erected in 1916, just a year after Gallipoli. The Monument Australia website records that: “The Memorial is a band rotunda faced with name plates and commemorative plaques. 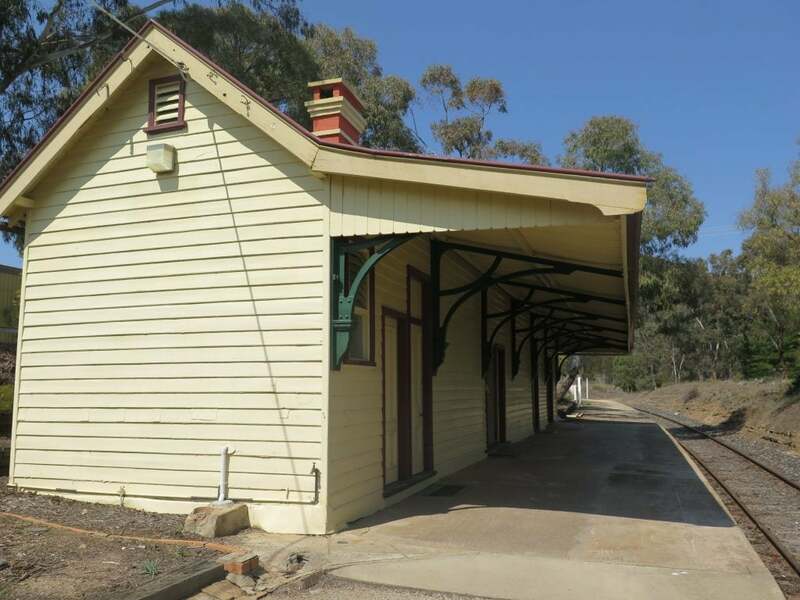 It cost £244 to construct and was funded through the efforts of the Gulgong Progress Association. 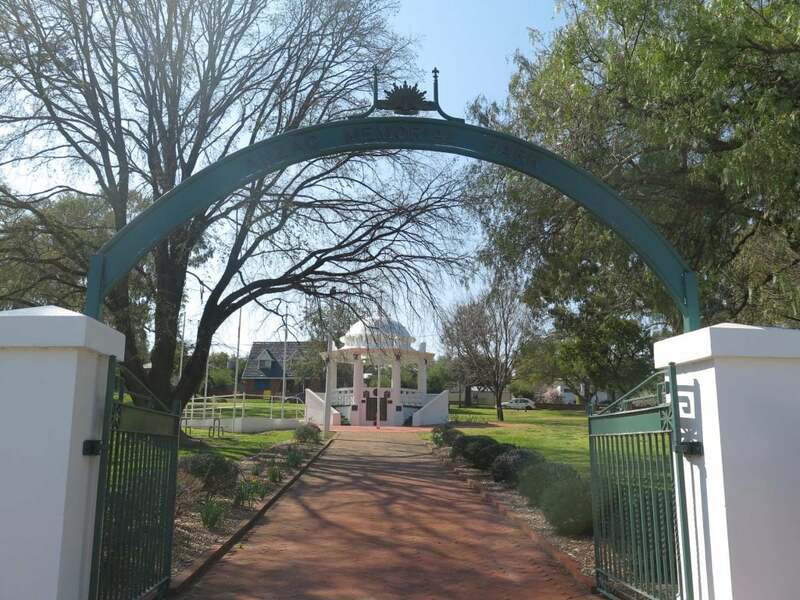 The memorial rotunda in Gulgong’s ANZAC Park is the second oldest in Australia. The memorial was built in 1916, two years before World War One ended, and was officially unveiled in 1918. The World War One plaques were added to the rotunda on the official opening of the Memorial Park on Anzac Day 1929. The Henry Lawson Centre (above) in a 1920s Salvation Army Hall was our second port of call, we arrived toward the end of a talk being given by one of the locals with a deep interest and knowledge of the life of Henry Lawson. 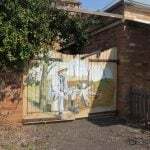 It has the largest collection of paintings, prints, cuttings, photographs and books outside of the Mitchell Library relating to Henry Lawson and they are organised according to significant phases in the writer’s life. Items include a flour bin made by Lawson’s father which was mentioned in one of the author’s poems, rare editions of his poems and short stories. There is a section devoted to the women in his life. 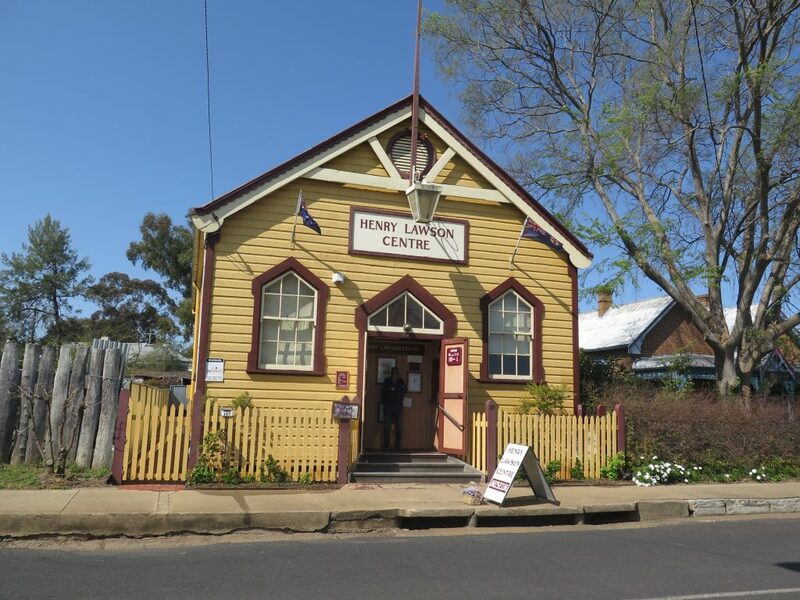 The hall was a virtual treasure trove of memorabilia of this famous Australian poet, and we spent some time browsing. 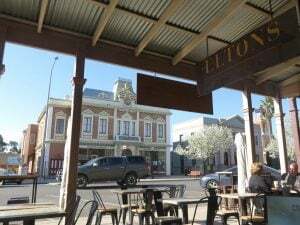 Driving into the main part of town, we found a car park and a bakery for morning tea, then walked around to see the sights of the very interesting and historic town. The Ten Dollar Town Motel (below left) and the Centennial Hotel (below right) were close together, further up the main street we saw the Prince of Wales Hotel and Prince of Wales Opera House (above), that was erected of bark in 1871 and was probably the largest free-standing bark structure ever built. At that time it was known as Cogdon’s Assembly Rooms. Thomas Alexander Browne, who wrote Robbery Under Arms under the pseudonym ‘Rolf Boldrewood’, was the town’s police magistrate from 1871 to 1881. It is said he held court at Cogdon’s Assembly Rooms using the piano as the official bench. 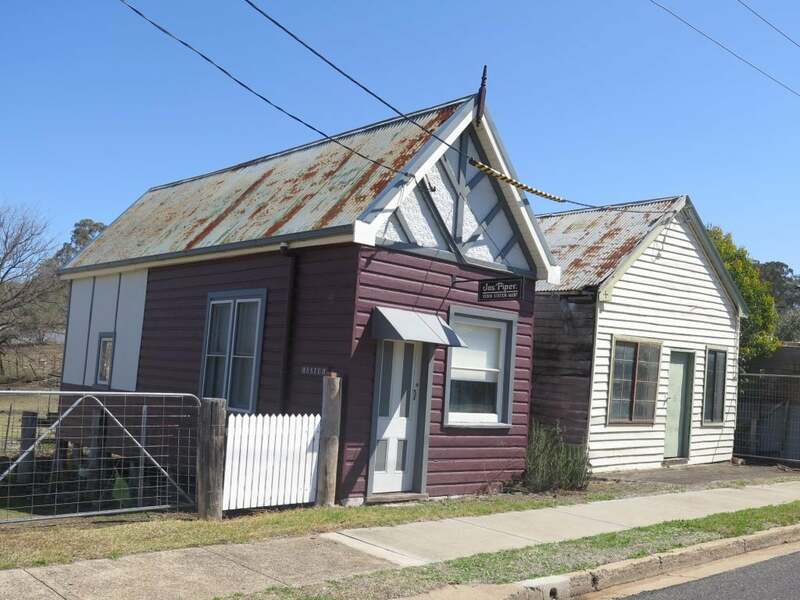 A new roof, weatherboard facade and wooden floor were later added and the name changed. In the town’s gold rich heyday it was claimed that some female performers had gold nuggets thrown in their laps whilst performing. The legendary boxer Les Darcy fought an exhibition bout at the Opera House before he departed for the USA and Dame Nellie Melba gave one of her earliest performances here while still performing under the name of Mrs Armstrong. In front of one of the houses in Mayne Street is a Mile Post with the marking HR – 7 Miles (below). It refers to the distance from the mile post to Home Rule which was a hugely successful gold mining settlement. The horse trough, which is over 100 years old, was donated by George and Annis Bills. 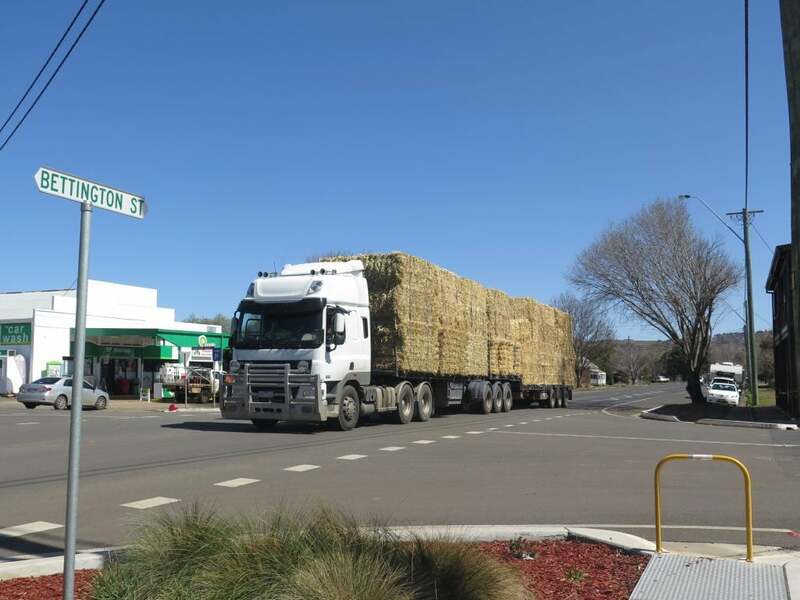 Horse lovers, they donated horse troughs around NSW, Queensland and Victoria. 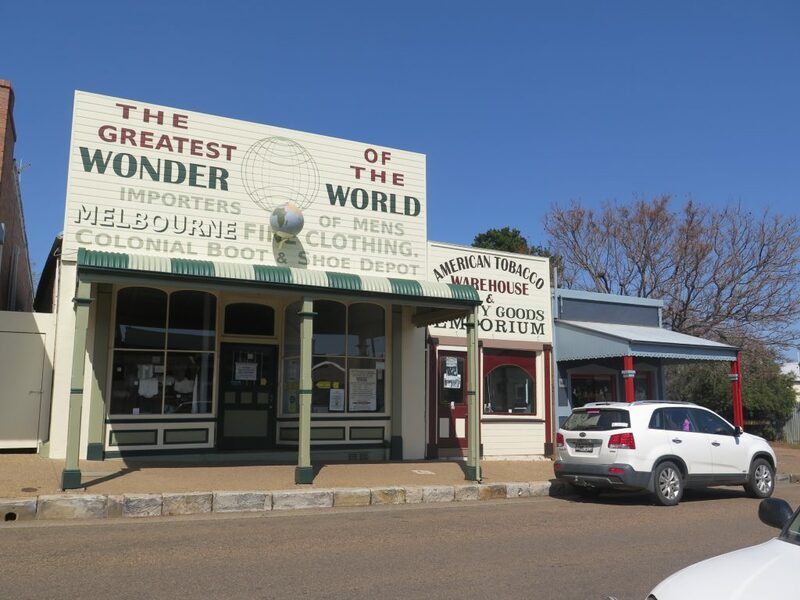 Located at 123-125 Mayne Street, the Gulgong Holtermann Museum (below) is now located in the restored “The Greatest Wonder of the World” and “American Tobacco Warehouse & Fancy Goods Emporium” which have had their original facades re-established. Gulgong was particularly well-documented photographically, owing to the Holtermann Collection. “In August 1872, photographer Henry Beaufoy Merlin and his young assistant Charles Bayliss arrived in Gulgong and in less than two months they had photographed buildings, street scenes, panoramic views and the people of the rapidly growing town and its surrounds.” “After Merlin died the collection, amounting to around five hundred glass plate negatives, was purchased by the wealthy Hill End miner Bernard Otto Holtermann. These he added to his collection of commissioned photographs by Merlin and Bayliss. 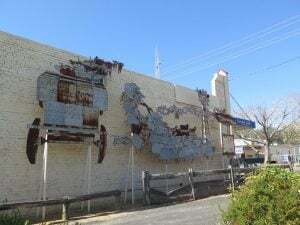 Fortunately the Gulgong plates survived and are now part of the renowned Holtermann collection which are housed in the State Library of NSW and recently inscribed on the UNESCO Australian Memory of the World Register. Some of Merlin’s photographs provided the basis of the images on the rear side of the old $10 note. 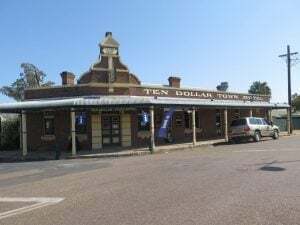 There is much more to see in Gulgong than we had time for, a good excuse to go back to the Mudgee area to discover what we missed this time. 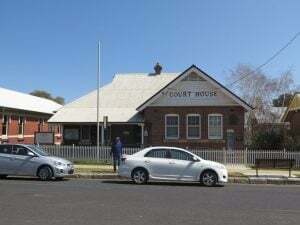 The old Court House (below) was another charming historic building. 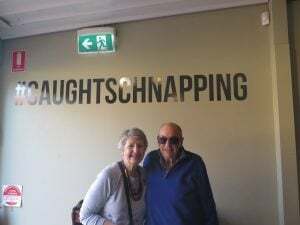 The rest of our trip was pleasantly uneventful, except for another stop at Merriwa for a coffee, then back to Newcastle after a fabulous couple of days exploring Mudgee and surrounds and the beautiful Cudgegong River and valley. If you have not been to this area, you should not miss out seeing it, well worth the trip.